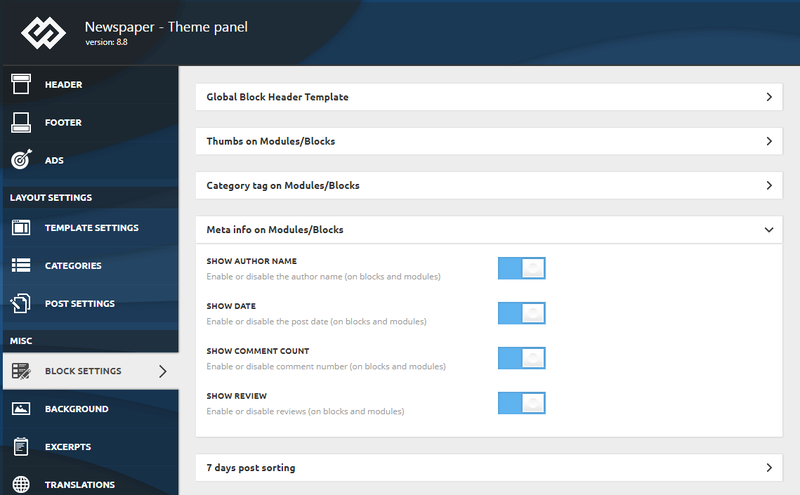 In the Newspaper theme, you can choose what meta info to display on both Modules and Blocks and individual posts. In this section, we’ll show you how to manage the information for Modules and Blocks. This means that you can decide to display author, date, comment count or reviews on the different templates. The functionality applies to the categories, author templates, search templates, as well as single pages of your website. Access Newspaper > Theme Panel > Block Settings and navigate to the “Meta Info” section. You can disable or enable the information you wish to show on the blocks and modules of your site while still maintaining them on your posts. Note: The meta information for posts can be enabled/disabled from the Post Settings section of the theme panel.